A recent business intelligence study by Transparency Market Research (TMR) has detected that the competition in the global calcium carbonate market is intense, and heavily dependent on supply chain of the players. What has increased the emphasis on having a strong distribution network are various governmental policies regarding the exaction and operation of calcium carbonate. Players are forced to maintain socioeconomic benefits as well as reduce environmental impact. Some of the prominent players who are ahead of the curve in the global calcium carbonate market are Omya AG, Minerals Technologies Inc., Mississippi Lime Company, Imerys, United Mining Investments Co., Yuncheng Chemical Industrial CO., Ltd, Huber Engineered Materials, Global Calcium Carbonate Industries, Zhenjiang Jiande Longhua Plastic Chemical Co., Ltd, Maruo Calcium Co. Ltd, Okutama Kogyo Co. Ltd, and Schaefer Kalk GmbH & Co KG. Most of these players are also concentrating on establishing on-site production facilities, as it helps them in providing high quality precipitated calcium carbonate (PCC). In the near future, the calcium carbonate market players are also expected to focus on product development in order to maintain their stronghold. Ittihad International Investment LLC signed a deal with Valmet-a paper machine manufacturer-in Mar 2017 for installation of a new production line with automation package in Abu Dhabi, UAE, to produce high-quality printing and writing paper grades for the growing markets of Middle East and North Africa region. As per the projections of the TMR report, the valuation of the global calcium carbonate market will increment from US$15,158.33 mn in 2017 to US$17,643.29 in 2020 and US$22,311.06 mn by the end of 2025, with the demand expanding at a notable CAGR of 5.0% during the forecast period of 2017 to 2025. Based on product type, the report segments the calcium carbonate market into PPC and GCC, whereas application-wise, the market has been bifurcated into plastic, paper, paint, adhesives and sealants, rubber, and building and construction. Geographically, the analysts have highlighted Asia Pacific as the most lucrative region by a long margin, promising to provide for a demand worth of US$12,231.16 mn by 2025. 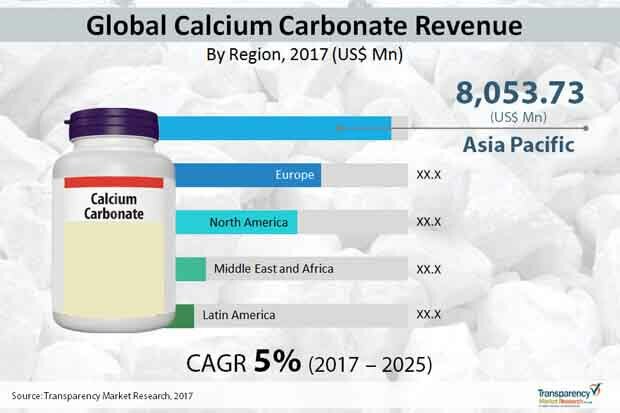 The Asia Pacific calcium carbonate market is projected to gain new demand at a CAGR of 5.4% during the aforementioned forecast period, which is much stronger than other moderately profitable regions of Europe and North America. The prosperity of the industries pertaining to paper and building and construction are providing the strongest traction to the global calcium carbonate market. Calcium carbonate is increasing replacing kaolin in the paper industry. In addition to that, growing demand for non-calcium carbonate in the plastic and rubber sectors, strong demand for waterproof and anti-smudge paper products in the building and constructing sector, escalated emphasis on using bioplastics, increasing usage of calcium carbonate as drug templates is expected to reflect positively on the market. Growing focus on increasing mineral loading in paper, consumption of the compound in the paints industry, and government initiatives for the growth of the plastic industry in the Middle East are some of the other drivers promising a healthy future for the global calcium carbonate market. On the other hand, environmental hazards of mining limestone and issues regarding excessive usage of calcium carbonate as dietary supplements are a few restraints obstructing the expansion of the calcium carbonate market. Demand in the global calcium carbonate market to increment at CAGR 5.0% during the forecast period of 2017 to 2025. Asia Pacific the most lucrative region and primed to remain so. Competitive Landscape highly dependent on the strength of supply chain.